We've all heard the apocryphal tales of companies who put their pet projects on crowd-funding websites and made millions. A group out of Vancouver asked the question: "How can we leverage this zeal and social funding for good?" In July, Weeve was born, and they have helped dozens of not-for-profits achieve crowd funding success. Alex Chuang explains how they've had early success. We've all heard the apocryphal tales of companies who put their pet projects on crowd-funding websites and made millions. A group out of Vancouver asked the question: "How can we leverage this zeal and social funding for good?" In July, Weeve was born, and they have helped dozens of not-for-profits achieve crowd funding success. Alex Chuang explains how they've had early success. Where did the idea for Weeve come from? Weeve was an idea that was incubated in my head while I was doing my master's degree at the UBC Sauder School of Business two years ago. As part of the curriculum, we had to take a course where the school paired students with nonprofit organizations to work on community business projects such as a market research report. During my placement, I talked to representatives who were working in the nonprofit sector and I realized that nonprofits face two challenges -- lack of funding and lack of exposure. Then I learned about Kickstarter and thought to myself, what if we could build a crowdfunding platform that helps nonprofit organizations raise money and awareness, but also have brands reward donors with free gifts or coupons. I wanted to create a win-win-win scenario where donors are rewarded, nonprofit projects are funded, and impressions of corporate social responsibility are improved. In a world of Indiegogos and Kickstarters, where does Weeve fit in? Weeve is a crowdfunding platform specifically designed for nonprofits. Through focus group and customer feedback, we realized that features such as downloadable donor list for tax receipt purposes are crucial for nonprofits. We understand that the perk system used by Indiegogo and Kickstarter does not apply to many nonprofits so it does not exist on our platform. We have gone through rigorous UI/UX testing to make sure our platform is as simple as possible. How did you get your initial plan and team together? Did you bootstrap Weeve? After pitching the idea to my best friend, Vincent Chu, who is a computer science genius, we both got excited about the idea. In October 2011, Vincent came over to my place and started mapping out the entire website on post it notes. He said to me, "Let's do this" and thus, Weeve was born. I was confident that Vincent's computer science background and programming expertise would be able to bring the idea to life. As CTO, he coded the entire website from scratch including all design, front-end and back-end development. After months of deliberation and revision, we finally came up with a prototype. In February 2012, I met Trevor -- a Vancouver Park Board Commissioner and nonprofit professional. I knew that Trevor's strong nonprofit background and sound business acumen would be a great fit for Weeve, so I invited him to join as a co-founder and COO; he gladly accepted the offer. Assembling the right team was incredibly difficult. We've had different people working for us for short periods of time, but to find someone who is willing to commit full-time and is equally passionate about social good was near impossible. Therefore, I am incredibly thankful for my co-founders who have committed so much to the project. At the time, we didn't even know what bootstrapping meant. We kind of just went ahead and did it. When did you decide you needed outside funding? The original plan was to bootstrap and see if we could perhaps sustain ourselves with a 5 per cent transaction fee. Then we realized that in order to position ourselves as a market leader, we need to gain critical mass first. Therefore, we threw the entire crowdfunding business model out the window and replaced our revenue model with moment-based advertising, where donors are rewarded by brands and advertisers at these moments of giving. In order to validate our new moment-based advertising model, we decided that we need outside funding to keep things afloat. What was your experience on the money trail like? Both Vince and I invested $4,000 of our own money into Weeve. We also got $5,000 in grant money from YMCA's Youth Mean Business Program. Then we got accepted into GrowLab's Farm Team program and was offered $5,000, free office space and mentorship. Raising money is extremely difficult. It's usually a six to 18-month conversation. I would recommend startups to join accelerator programs like GrowLab or education programs like Launch Academy and stay proactive in the startup community. Can you describe your experience being affiliated with an accelerator? Founded by super angels, Mike Edwards, Boris Wertz, Jason Bailey, Leonard Brody, and Debbie Landa, GrowLab is a Vancouver-based tech startup accelerator. Led by Mike Edwards from Initio Group, GrowLab has helped many tech startups chase their dreams. After going through a rigorous interview process, Weeve was selected as one of the three startups to join GrowLab's Farm Team Program. We were offered seed funding, office space, and mentorship. Before coming into GrowLab, I was banging my head against the wall, trying to figure out how to build a company from scratch. We were super stoked about working in a co-working space that GrowLab and Launch Academy offer. One of the perks of being a part of GrowLab's Farm Team is that we also have exclusive access to Launch Academy's benefits, which include mentorship, workspace and access to special events like DemoDay and Launch@Grow party. Both GrowLab and Launch Academy have opened so many doors for us. We have built strong relationships with investors, strategic partners and new customers at DemoDay, Launch@Grow and the Grow Conference. We have learned so much from Vancouver's best and brightest mentors. We have failed and succeeded in so many ways. You moved to Seattle. Did you have trouble getting what you wanted out of Canada? We actually didn't move to Seattle. One of the perks of being a GrowLab Farm Team startup is guaranteed participation in exclusive events. We are very fortunate to be selected as one of the few startups to go down to Seattle and pitch our idea to the Alliance of Angels. The Alliance of Angels is one of the largest and most active angel groups in the Pacific Northwest. They have invested more than $70 million into 180 companies since 1997. Vince and I had the chance to pitch to 25 angels that day. We definitely learned a lot from the feedback that we got from the angels and we know we are too early for angel funding. How did you gain traction? Weeve was launched on July 2, 2012. We positioned ourselves as world's first free crowdfunding platform for nonprofits as we don't take any transaction fee. We launched with four active nonprofit leaders in Vancouver: B.C. 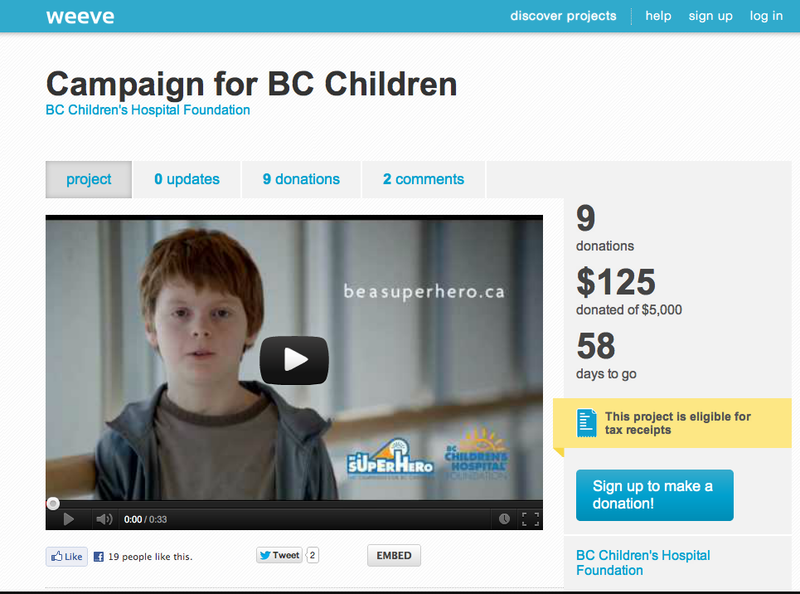 Children's Hospital Foundation, Seva Canada, Shark Truth, and YouthCO, each with a unique story and project. We quickly gained momentum as we were featured on Digital Journal, Metro, TechVibes, Business In Vancouver, Vancouver Observer, Vancity Buzz, Tech Crunch, Venture Beat, and Inkable. Three months after our launch (with zero marketing budget), we were able to attract 65 sign ups and 15 active projects. What has been your acquisition strategy so far? Referrals, networking, events, conferences, cold-calling, strategic partners and public relations. 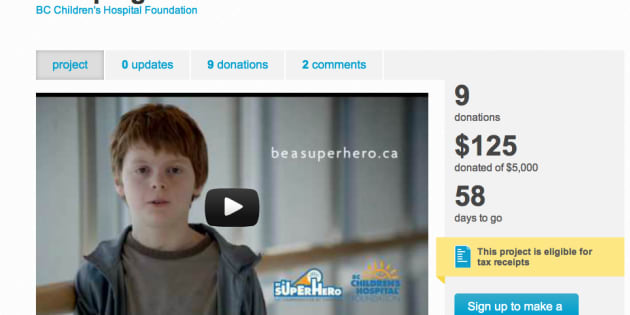 Ever since our launch in July, we have raised more than $8,000 for nonprofits in Vancouver. We have over 60 nonprofits who have signed up on our site and are ready to launch their community projects. We are planning a Christmas Campaign that will bring one corporation and nonprofit organization together to drive positive social change. We aim to raise $100k for this campaign.